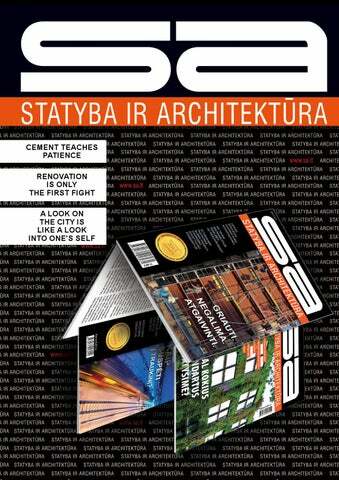 JSC „Statyba ir architektūra“ (“Construction and architecture”) Editorial address: UKMERGES str. 222, LT-07129 Vilnius, Lithuania Tel. +370 5 249 6302 Fax. +370 5 278 4551 E-mail. info@sa.lt Editorial Board: Gintautas Blaziunas, Lithuanian Architects’ Union President; prof. Dr. N.Cygas, Dean of the Faculty of Environmental Engineering, VGTU; Assoc. Dr. Algirdas Juozapaitis, VGTU Constructions faculty Dean; Pranas Rimvydas Pranaitis, Lithuanian designers’ companies union Executive director; Assoc. Dr. Zymantas Rudzionis, Kaunas Technological University Constructions faculty Dean; Mindaugas Statulevicius, Director of the Lithuanian real-estate association; Adakras Sestauskas, Prezident of the Lithuanian builders Association; Aidas Vaiciulis, Director of the national passive house association; Diana Varnaite, Cultural heritage department director; Juozas Vaskevicius, President of the Lithuanian room of architects. Dear readers, The constructions industry is one of the industries where Lithuanian companies feel equal to their foreign colleagues. The factor that may stop the successful development is the lack of information, which may occur in some point of time. Our journal–“Construction and architecture” has recently rejoiced it’s 90th birthday. We cover topics such as: constructions, architecture, urban development and real estate, and we use each and every possibility we have to present you the new steps of Lithuanian companies, developing their business at home and abroad. The printed version of our journal is being issued in Lithuanian language and is distributed in Lithuania. The electronic version of the publication has yet been sent abroad only to those who understand Lithuanian language. We believe that the new “Construction and architecture” project–an electronic publication for English and Russian speakers will reach both East and West Europe, Asia and both American continents, and will help the companies of our country to search for partners and production markets in foreign countries. Every month a printed version of the “Construction and architecture” is being issued in Lithuania, this journal covers all relevant topics in areas of: construction, engineering, architecture, urban development, real-estate infrastructure, energy, environmental safety, environmental care, protecting cultural heritage, renovation. We work closely with more than 30 active associations in Lithuania and all municipalities of the state, we also work closely with our Economy, Energy, Transport and communications, Environment, Culture and other Ministries and their dependent companies, as well as with the Vilniaus Gedimino Technical University and Kaunas Technological University. We are constantly working on publications on the changes of the Lithuanian legislative framework, currently implemented or planned constructions sector projects, as well as European Union funds supported projects. We present the newest construction industry technologies and products, publish information relevant to architects and designers as well as their exceptional pieces of work, we provide information We would be happy to see that the printed on real estate industry area forecasts and estiversion of the “Construction and architecture” mates. journal would seem an appropriate platform We would like to draw your attention to the for foreign companies who seek business part- fact, that for our first self-introduction abroad, ners in our country and who want to offer their we have created an electronic publication comproducts to the small but ambitions Lithuanian piled from this year’s “Construction and archiconstructions market. We won’t sorrow if our tecture” journal’s theme issues, that were covelectronic publication advertisers will find cli- ering the topics of renovation (January), railway ents or partners in countries other than ours, in infrastructure (February), concrete and related some other place where “Construction and ar- technologies (March), Lithuanian self-governchitecture” journal will travel. ment actualities (April), geology and building The electronic “Construction and architecture” energy-efficiency (May). journal is being sent to associations related to the construction industry and to other organizations, who, in their turn, may distribute the publication amongst their members. Those are industrialists, construction workers, architects, designers, energy or plumbing specialists, environmentalist, road experts, and associations uniting construction material and constructions producers. As we all know, one of the most accurate indicators of the construction business welfare is the trade in cement; this indicator shows positive trends already for several years in Lithuania, but we still have to wait for the sales amounts to reach the pre-crisis times. Reduced by almost half during the darkest times of the financial crisis, it is now growing for a couple of percent annually. The sales were saved by export Here is an ambitiously sounding fact– during the year 2012, the “Akmenes cementas” export has surpassed the local sales for the first time ever. This shows that the difficult market situation forced the company’s managers to promptly seek possibilities to sell their produce abroad. This has led to some radical changes in the sales structure of the only cement producer in Lithuania; some time earlier “Akmenes cementas” has been selling approximately 80% of their produce on the local market as it was oriented for domestic sales, but last year, the percentage of local sales decreased below 50%. The “Akmenes cementas” covering approximately 75% of the country’s market has sold 908 thousand tons of produce in 2008, 2009 – the number was 409 thousand tons, but the following year showed the above mentioned moderate recovery in sales: the 2010 figures are – 476 thousand tons and 543 thousand tons in 2011. In the year 2012, the market was quick to react to the bankruptcy of the “Snoras” bank and other economic challenges, so the figures decreased again – “Akmenes cementas” has sold less than the previous year – 474 thousand tons of produce. A moderate growth of sales equal to a couple of percent is planned for this year sales in Lithuanian market, approximately 490 tons are expected to be sold. Successful marketing abroad gave “Akmenes cementas” a possibility to reach the pre-crisis level, when they were selling the amounts of produce equal to the maximum output of their production line – somewhat more than 1 million tons of cement. 2009 is recorded as time of dramatic sales decrease in the history of the company – only 572 tons of products were sold, but the last year’s results are more optimistic – “Akmenes cementas” sold 998 tons of cement. During the year 2012, cement of Lithuanian origin was sold to Russia (180 thousand tons), Belorussia (188 thousand tons), Sweden (91 thousand tons), Finland (30 thousand tons), and other foreign countries. the results of “Akmenes cementas” were exemplary. The contracts were signed during that year and it took almost a year to build the machinery for this line, only after that did the financial crisis come in effect. The line is expected to begin operation in the second half of this year, this would allow to save about one third of energy costs and recover the invested 363 million Lithuanian Litas in a 10 years period. During the Soviet period of Lithuanian history, approximately 1,5 million tons of cement was used annually, the number decreased to 1,1 million in the pre-crisis times, and nowadays reaches only 600-700 thousand tons. ba said that before the foundation under decision to build the Visaginas nuclear power plant became shaky, his factory has been visited by the strategic investor of the project – the Japanese company representatives. “Although such projects are important for the prestige of the company, are economically good for the country and the business reacts positively to any investments, this doesn’t have a large influence on the sales of our company.” – A. Zaremba commented. The total amount of cement used even in such a large project as the construction of the Visaginas power plant would require approximately 50 thousand tons. It takes approximately two weeks for “Akmenes cementas” plant to produce such an amount. “We may even say that we profit more from the large scale, mass projects, for example – renovation of many homes. For us, it would have a larger impact, than larger individual construction projects.” – said A. Zaremba. The overall economic situation in Lithuania is also important. “Cement sales decreased by 10% last year, when the “Snoras” bank bankrupted. This happened because the money is usually invested in infrastructure and development during the good times and a comfortable economic situation, should this change – these expenses are the ones to be cut first. That is why the overall Lithuanian economic trends are particularly important to us, economic growth or at least it’s expectations always have an impact on our sales” – said the representative of the one and only cement producing company in Lithuania. analysis”. “Akmenes cementas” produce is bought by all large concrete and reinforced concrete producers in the country, although it is true, that some of them diversify their supply. Asia is ahead of Europe It’s been five years since the “Akmenes cementas” became a part of the European cement association CEMBUREAU. It brings together national cement associations of EU countries, and from countries such as Lithuania, where there is only one cement producer, such companies become the national associations themselves. The information provided to the CEMBUREAU participants shows, that the demand for cement is growing around the world, but there is no euphoric happiness in the ranks, as A. Zaremba says, although approximately 3,3 billion tons of cement is produced annually, and that amount increases by couples of tens or even a 100 millions of tons each year, the increase happens outside of Europe. “The most growth is experienced in Asian markets–more than 50 percent of cement is being made and used in China. On the contrary, in Europe, the amount of cement used is decreasing”,-explained the General Director of “Akmenes cementas”. “Germany, France, United Kingdom, Italy and Poland are the largest consumers of cement in Europe, and the situation in these countries’ markets is the same as in Lithuania, the sales have dropped by 40-50 percent and are now growing by 2-3 percent annually, although such numbers are not encouraging, it is good, that the sales are at least not decreasing”. Renovation is a State issue, the State should carry out the tenement houses modernization program, and the residents are obliged to help the state to do so. the residents themselves, and not the State. Furthermore, the support, that individual house owners acquire, should be differentiated. It would be socially wrong to provide the same amount of state aid, because it takes a lot more money to provide heating for 1 square meter of an individual house. I agree with the fact that support should be provided, but there is a need to evaluate various nuances. - What other flaws do you see in the renovation program? - We should analyze the whole situation, not only the old buildings. Because, for example, if there will be a couple of hundred of houses renovated in one city, they will need half the heat they previously consumed. That means that the city boiler room will not be adequate to the city’s needs. If the boiler will be operated at half of it’s capacity, the heat suppliers will need to increase the heating prices. It is therefore necessary to review the situation of the whole heating economy and thus, this is a State interest. The State interest is also in the fact, that after a lot of houses will be renovated, and when the heating infrastructure will be renewed, the State will need half of the gas it is currently consuming. And this is a real energy independence of our country. houses for 30, 40 or even more years. Their children, who have been brought up in those flats, and have escaped those conditions, went to the suburbs in search of a better quality of life only to realize, that their hope of ever having proper social or engineering infrastructure needs to be buried after all. “It turns out, that young people grow their children in territories hardly adapted for that cause. And then we are surprised by the fact, that Lithuanian people don’t want to raise children”, - said M. Pakalnis. just in front of their old tenement house. The most important thing is that social diversity is taken care of this way. It’s a necessity, which the current urban development science is highlighting. According to T. Jonauskas, the fact that Lithuanian society prefers not to integrate, but to form closed, sealed off and fence protected societies – should not come as a surprise, he says it is a normal phenomenon in a post-soviet country. But the urban development expert highlights that the safety in this case is only conditional. Apprentices of Holland’s urban development school, J. Muliuolyte and T. Jonauskis speculate, that this is only a stage in the development of public society, that shows, that communities brewing in such incubators causes only social trouble. Each of the capital’s neighborhoods has the potential to become a small organism that will be able to satisfy all of its daily needs, where there would be working places and leisure areas and a lot more, because everyone has good roads, public transportation, spaces, where you can install new functionality. ment owners’ rights, in Lithuania at this point of time. The cause of this is that the most of the buildings belong to private individuals. In order to demolish such a tenement house, the state must address the delicate question of ownership; it must agree with a 100 percent of all flat owners, buy all of the flats or give some other housing in return. “There are different models used in the world, but the necessary condition of all of them is a very strong self-government situation. If the amount of municipal housing reaches at least 20 percent, it gives a possibility for a maneuver, there is a possibility to temporarily move the people to that municipal housing, buy the apartments for the remaining price and then demolish the building, etc.”,- said R. Dargis as he explained the situation. “- And we lack that self-government as western countries understand it, that solves 80 percent of a person’s problems. In Western countries the municipality has it’s own rights, duties, and most importantly–property: land and real estate which it may use to generate a better way of life for people. It is incomprehensible, why didn’t we develop self-government for the last 22 years, why don’t we allow true leadership to show itself.” R. Dargis argued, that Lithuania might use a similar model: “Some tenement houses contain approximately 20 percent of empty flats, because a part of the residents have died, some of them emigrated, the third ones ran away from the utility taxes to suburbs. Municipality could start a buying process and take the social role, which it could really accomplish and successfully finish. The role would be to transfer residents from some of the houses, take proper care of their old building, change its status to municipal housing and in such a way grow a base needed for larger changes. But in order to do so, two things are required: strong self-government and a strong desire to act”. would a person gain if he lives there. Creating a right image is a part of the city regeneration process. Each block or neighborhood could acquire a nice public image if you create one properly.”, - said J. Muliuolyte. T. Jonauskis and J. Muliuolyte are convinced, that the most appropriate advertisement for a complex bloc renovation would be the residents, who would see, that the State cares not only for the shortterm (a year or two) aim to insulate the houses, but also, cares about the long-term strategy and has a territory development vision. A great complex neighborhood regeneration could be made of the Uzupis region or the “Northern city”. “At the moment such things are not carried out in Lithuania, but people need to be provided with exact information on what steps we should take now, and what should we do in five or ten years. It is very important to name the possibilities and changes that will appear after each stage has been completed. In such a way, people would see that even small interventions can radically change the situation the neighborhood is in. We need to create a strategy and win many battles, if we want to come out victorious in this war”,- said T. Jonauskis. The opinions of both of the experts that came back from Holland agree upon this: house insulation may be the first step in neighborhood regeneration, but it should be followed by the second and third ones–new jobs should be created, public spaces should be reorganized and so on. “Unfortunately, Lithuania still carries out its single function policies– each neighborhood and/or block has it’s own purpose, just as this was during the Soviet era: the center part, the administrative center, residential areas, the gardens, etc. But each of the capital’s neighborhoods has the potential to become a small organism that will be able to satisfy all of its daily needs, where there would be working places and leisure areas and a lot more, because everyone has good roads, public transportation, spaces, where you can install new functionality. If you judiciously, assess all tasks, the city begins working as a fine engine. Excessive ambition fill Vilnius’s urban plans only ruin this vision”, - lamented T. Jonauskas. more people who could uphold and buy such living premises that meet the current standards by 2050.
base or recommendations for renewing the historical buildings and increasing their energy-effectiveness. This project is conditionally called “CO2olBricks”, with the name coming from energy costs reduction (energy consumption can be measured by CO2 emissions to the environment) and historical brick houses. People always have to look for a compromise between the profitability, saving the buildings authenticity and the comfort level while renewing an old building. window installment, regenerative systems and personal heat pumps installation. Passive homes or even homes that create more energy than they consume became increasingly popular. Energy efficiency certificates have been issued and were used to evaluate buildings. The difference between the modern and historical buildings, in terms of energy saving became as large as it has ever been. This means that the historical buildings have become unprofitable; they have to be renovated or in some extreme cases, as it is being more commonly done in Europe – demolished. Judging the possibilities of the building to serve future generations may include many criteria: the general price of the building; cultural value; what level of energy efficiency and comfort can be achieved in a specific building; whether it will pay off economically. People always have to look for a compromise between the profitability, saving the buildings authenticity and the comfort level while renewing an old building. Usually whenever a building is becoming energy-efficient it is hard to save all of its beauty. It’s a particularly acute problem with the brick facades, typical for houses all over the Baltic Sea region and the outside insulation. Although there are many ways to do so by using costly brick imitations, such walls are never quite the same as the real brick walls. Modern insulation materials would allow to insulate buildings without losing a lot of space, 5 centimeter thick layer of vacuum plate or aerogel is enough to insulate the wall as good as 20 centimeters of rock wool or polystyrene would do. But then the problems of moisture and dew appear. The historical buildings’ walls should be ventilated, they should be a little warm, so that the moisture coming from the outside and condensing from air, could evaporate and not stay in the walls. A lot of modern materials have very good insulation properties but are absolutely impenetrable to water vapor – moisture, which should come to or leave the buildings walls depending on the year’s season. If we insulate the wall of the building too much from the inside, the walls begin to “sweat” and the moist brick begins crumbling after a few cycles. “Co2olBricks” project expert group has examined the currently used means to renovate the historical buildings and are still studying the effects of some of the commercial products. Experts have reached a conclusion, that not all means are good for historical buildings. Although individual measures should be applied to different buildings, experts have come up with the list of the most effective and cost-effective means at the current time (see the table). Lithuanian experience shows that you need no expert conclusions, for the people to begin applying the least costly and most effect-generating measures. This is clear after we investigate the window conversion boom or one of the effective least costly measures used by people with smaller income – properly sealing off door and windows cracks. Summary 1. Energy efficiency, which can be achieved in historical buildings without sacrificing it’s authentic elements is far beyond standards used to evaluate modern buildings. 2. The energy-efficiency certification according to the STR (construction regulation) 2.01.09:2005 is not mandatory at this point of time for buildings that are included in the cultural heritage list, if the changes would affect their special features or the look of the building. This eradicates legal problems with cultural heritage buildings renovation projects, but ignores the energy-efficiency and comfort of the residents. 3. There are quite a lot of authentic buildings, which are not included in the cultural heritage, but have valuable features that should be preserved. Such historical buildings’ energy efficiency certification could provide more information to their residents, would help them to evaluate energy losses and promote everyone to search for all kinds of power saving possibilities. 4. According to the Western European country experience, the building energy performance certification system can be applied to historical buildings, but the requirements would have to meet the cultural heritage protection regulations, so that the unique identity of our city would not be destroyed. Most likely, that the truly authentic buildings that have retained may protected features, the energy efficiency level could be raised by one or two categories. This article has been created according to the “Co2olBricks” international projects ‘ seminars, the author is the projects’ expert. The main Lithuanian railway transport network aim is to create a modern, balanced, safe, interconnected, competitive, environmentally friendly railway road system which will effectively meet the needs of both business and the country’s residents. That is the opinion of the Minister of Transport and Communications Rimantas Sinkevicius. He told “Statyba ir architektura” (Constructions and architecture), that the technical state of the main railway lines determines the possibility of the railway carriers to transport goods and passengers, especially on international routes. the data transfer, communication and automation infrastructure. We have also renovated more than 60 of the most crucial railroad constructions, including Kaunas railroad tunnel amongst them. During the period of 20072013, approximately 1,9 billion Litas of investments are planned to modernize the infrastructure of the Lithuanian railways. Of these, the Ministry of Transport and Communications has already issued 1,2 billion Litas of EU structural funds support for 26 infrastructure modernizationprojects. support for 26 infrastructure modernization projects” , - said S. Dailydka. The head of “Lietuvos gelezinkeliai” states that the implemented railway infrastructure constructions development and traffic management technology projects will help to increase the traffic flow capacity of stations and railroad stretches between them and reduce travel time. The electrification works in the railroad line Naujoji Vilnia-Kena-State border-Gudagai have already been started, this will help to increase the traffic flow between the states of Lithuania and Belorussia. During the 2014-2020 financing period, “Lietuvos gelezinkeliai” plan to invest more than 7 billion litas. This amount is needed in order to fully electrify the double-tracks of the IX corridor railroad. If such a result would be achieved, goods would be transported from Belorussia to the sea-port of Klaipeda by using electricity driven trains and passengers would travel from Vilnius to Minsk, Vilnius to Kaunas and Vilnius to Klaipeda and the other way back, by high-speed electricity driven trains that could go as fast as 160 km/h. “Our company has no possibility to invest such an amount by itself, so the EU structural funds support in modernizing the railroad infrastructure and it’s development is really important”, - S. Dailydka noted. Railway transport infrastructure projects are complicated and require significant time and financial costs. The mere preparation of the technical documentation for the implementation of the projects lasts for a period of 3 to 5 years. Different institutions and municipalities come up with significant and sometimes unreasonable demands. railroad lines, by increasing their traffic capacity and improving their general state. During the period of 2007-2013 the largest amounts of money were spent on railway modernization and development in the history of Lithuania as an independent state. Each and every country takes special care for the development of this type of transportation, which is the reason we are keeping up with them. The newest and most advance technologies are being installed and modern traffic control center is being currently built. and environmental safety, modernize the current and develop the new two track railway system infrastructure and rolling stock, develop interaction between different types of transportation and the railway transport. Horse riding arena in Prienai (2008). The company “Jūrės medis” was established in year 1974 when the factory of glue laminated timber (glulam) was built. From the beginning the main activity was manufacturing of high technical level glue laminated timber products for public, industrial, agricultural and residential purpose buildings. “Jūrės medis” has experience almost 39 years of manufacturing that. Our company believes that innovation is a key for success. In 2008 the company completed modernization and reconstruction of the factory. More than 11 mln. EUR investment was made; a new modern production line was installed. As result of this project production capacity has increased almost twice and “Jūrės medis” has become one of the biggest and most modern glulam manufacturer in the Eastern Europe. As well new products were implemented. “Jūrės medis” has good experience in the foreign trade. The company exports about 80% of total sales to 12 countries. The main export markets are Germany, Italy, Poland, Norway, Russia, as well the company exports to Sweden, Japan and South Korea. Sales managers speak english, german, russian, polish languages. ”Jūrės medis” is ﬂexible and very customer oriented company. It has long experience to deal with special products for various projects or manufacturing customized products. Sports Hall, Checiny, Poland (2012). I am tired of working as a taxi driver for my kids. I am tired of burning the stove. I am tired of cutting the grass. I am sick of calling the eldership, asking them to clean the road. I don’t have the time to enjoy the life in the wild… The mass-media stories of people, who found the new quality of life in the country, are changed by confessions of the people who came back to the concrete jungle. life cost several tens of kilometers away from the center of the city. “People imagine a life, where all of their concerns would be to connect to an electricity grid line, build a well, and construct a local sewage system. But they are then forced to spend a lot of money on car fuel , one of the family members can’t go to work because he or she has to take the kids to the school and back from it, and so the social problems start rising”, - said the “Vilniaus planas” architect. suburbs, but the State will not connect it to the engineering network and will not solve your social problems. But you need to have a strong backbone, political will and backup to do so publicly. This is the reason for some of the specialists to criticize the Lithuanian waterworks strategy ambitions. Tens of kilometers of drinking water and sewage pipelines laid in the ground for just a couple of houses provide unjustified expectations, that the State will broad heartedly take care of other suburb and countryside residents problems. Waiting for the search for solutions Although a part of the suburban residents are already looking towards flats in tenement houses, the movement the other side around has yet to stop. As it was before, the central part of the city is usually being left by the younger people, the infrastructure built to serve their needs moves with them: leisure places, secondary and high schools, kindergartens. By the way, people bring their children to the kindergartens and schools, but pay the revenue tax to other regions. So, the center of the city becomes occupied predominantly with people of elder age, who are usually not very pleased with all of the infrastructure created for the younger people, we can use neighboring noisy entertainment venues as an example. The problems with the upside-down urban development scenario are getting even more sensitive, say the urban development specialists. It should be noted, that in foreign countries, residence in the suburbs usually chosen by the elder people who have already brought up their children and have enough revenue to uphold several cars, people who want to live in clean and calm surroundings. They often also have flats in the city. If younger people decide to live in the suburbs they are sure to have enough money to hire people to drive their kids to school and / or to receive other services. The answer to the problems of Lithuanian cities is still somewhere out there, waiting to be found. It is clear that the analysis of motifs of people travelling out of the cities should be the one of the keys to finding the solution. The task is clearly not a simple one: to find a way to create a suburban life plan that would correspond with the current needs of people and state possibilities, in the current stretched-out suburbs of our cities. ent conflicts: politics against businessmen, architects against heritage protection groups, environment protectors against town communities and so on. According to the head of the “Aketuri architectai” (A-four architects) studio, architect Lukas Rekevicius, the city’s identity can be determined by splitting this term to three main groups. Those are–identity signs created by nature, such as the terrain, water sources, plants and trees; social and cultural identity signs – the main type of local business, the race and nationality of the inhabitants of the city or area, education, public safety, form of governance; and in the end–man created identity signs, for example, urban signs, architecture, public spaces. The last of the three layers of identity is a dynamic one, the one that is relentlessly renewing, changing along with the people that create it. The identity of the people has changed, but the city’s identity is being kept from changing, some people try to preserve the museum, formalin-soaked mood of the long gone ages. I offer to react to the changing identity of the residents in an adequate way by using means of the XXI century. 750th anniversary of the city in 1986. There were truly interesting architectural decisions in this “Sun city” image creation process: some have been implemented, others remained on paper. Some became symbols of the city and the others are long forgotten. Architecture in such cases becomes the sole instrument, which can help to visualize the chosen image on the face of the city. The sustainability of the city’s image forced from the top depends on the city’s inhabitants to accept it. It seems that the image of the City of sun is still used to base the idea behind the city of Siauliai, but I haven’t heard anybody saying “I’m a man from the city of Sun”. As a historian looking on the images and identities of cities being currently constructed I think that their authors overestimate their engineering abilities and the power of their decision-making, trying to offer the society things that have no historical basis and is a questionable value for the residents of the city. The impression, that the city leaves, is being formed by a number of hardly classified emotional and physical everyday experiences. We remember cities where it is easy and comfortable to walk, rest and work, the cities where public spaces are interesting and accommodate unexpected, interactive elements, the cities whose residents are nice and friendly, with joy. These are the cities we would like to come back to someday. tity fit together. Only if we understand what are the parts of identity of a particular city, and how they complete each other, can we purposefully plan an integral urban, architectural, economic, cultural, social, image model, that is needed to attract tourists and emphasize the city’s or the area’s identity, for its sustainable development.”, - assures L. Rekevicius. in the world. Everything is worth telling about, according to L. Rekevicius. There are no examples of great architecture in small towns, but there are rural farmhouses that perhaps, might be as valuable. There is the natural environment, and maybe some historical events have happened here earlier–all of it is sufficient to cherish and strengthen the small-town identity. ages. I offer to react to the changing identity of the residents in an adequate way by using means of the XXI century. of the festival or don’t participate in it, such type of a celebration is just a mere temporary intervention. The current urban science practice knows of a place making concept that, according to K. Lavrinec, can become a part of the city’s image creation arsenal. It is oriented to reorganizing the city’s small public places in small scale, with the help of local residents – the aim is to transform urban spaces to be more comfortable, friendly and emotionally attractive. “The impression, that the city leaves, is being formed by a number of hardly classified emotional and physical everyday experiences. We remember cities where it is easy and comfortable to walk, rest and work, the cities where public spaces are interesting and accommodate unexpected, interactive elements, the cities whose residents are nice and friendly, with joy. These are the cities we would like to come back to someday.”, - a belief J. Lavrinec shares with us. WHAT ARE THE CHARACTERISTICS OF THE MAYOR THAT ENLIVENED SPORTS LIFE IN UTENA OR WHY THE FLU EPIDEMIC WAS NOT DECLARED IN UTENA DISTRICT Famous for industry, well-groomed parks, great beer, with the best mayor of the country in 2013 and one of the oldest cities in Lithuania today Utena is rushing to become a real Mecca for sports and wellness. New sports complexes and fields, modern stadiums and sports halls, swimming pool and a reborn horse sport - it’s just a part of projects that have been, are been and will be implemented providing additional points to the town where is good to live and stay, forming new cultural and sporting traditions in Utena land. It all started from persistence and obstinacy of Utena District Municipality mayor Alvydas Katinas. Due to these characteristics of the mayor in 2009 the multifunctional sports centre emerged in Utena, stimulated new “sporting” ideas and new projects. Moreover, the sports centre has been recognized as the best Lithuanian sports building of 2009. It was declared by the Department of Physical Education and Sports Department that held a competition “Sports Building of the Year”. Multi-Sport Centre - probably the most expensive building in Utena, have cost nearly 40 million Lt. According to the mayor Alvydas Katinas, we should be happy that it did not become into a monument for “stupid” government and similar to Vilnius stadium. In this case, this government is unlikely to be forgiven by demanding people of Utena, sports lovers ... Now the different cultural and sporting events bring together more than one thousand people under the roof of Sports centre, it was difficult to think about it in the past. Let’s mention the professional basketball team of Utena “Juventus”, when people in overcrowded hall are watching matches. which allocated 800 thousand Lt from budget. Because of cold spring up to now hockey fans and skaters are hosting there. As soon as the weather became warmer they will be changed by football, tennis and exercise-loving people of Utena. Mayor A. Katinas take care of the development of sports infrastructure in Utena district. Focusing on high school stadiums Utena school stadiums also meet the needs of residents who go in for sports. Firstly, Dauniškis gymnasium stadium by the lake in the place liked by Utena residents is ready for it. The Ministry of Education gave 800 thousand Lt for reconstruction of the stadium last year. This May it will invite the first athletes. - After the reconstruction the stadium changed substantially - said the head of Planning and Building Department. - The quality of surface of running paths and playground are not different than Utenio stadium. We believe that the older people of Utena will come jogging to stadium and softened surface with springy deck of running paths will be suitable. Of course, the stadium will be able to develop various sports competitions, organize international championships. Now we are waiting for warming and planed works will be done. The works are left: hedge off the street, lighting installation, which gave the additional sum from municipality (70 thousand Lt) and second layer of paths. After installing the lighting it will be possible do sports late in autumn. Preparing the second phase of reconstruction of Vyžuonos Park was involved the stadium of Adolfas Šapoka Gymnasium. It is popular among close Aukštakalnio neighbourhood residents, so after the reconstruction, the rest of city residents will enjoy to do sports there. The technical project of the stadium is currently being finalized and the works should begin this year. Covering of sport field and running paths will be replaced, lighting will be renovated and beach volleyball court, the platform for 100 viewers will appear. EU has allocated 2 million Lt for all works. The stadium of “Saulės” gymnasium is waiting for its reconstruction, which is particularly needed. According to Nerijus Malinauskas it would be very nice that the Ministry of Education pay more attention to the state of stadiums of educational institutions and possibilities for students to exercise qualitatively. The Lithuanian Football Federation could contribute to the company worrying about the state of stadiums. After all in those stadiums the generation of young athletes of Lithuania is growing and preparing to storm the heights of sport. After the farm work - lots of sports - We have a lot to enjoy in rural areas, said the leader. – In five district towns Tauragnai, Saldutiškis, Vyžuonos, Užpaliai and Daugailiai – the project of public infrastructure is being implemented. Vyžuonos people will enjoy the first results of this project. It is planed in the project not only construct water and sewage networks, set and install new squares, paths, parks, but also establish a multifunctional sports grounds, where the local residents could play football, tennis, basketball or just play after the farm work. There is no doubt that this infrastructure will contribute to the life of local residents, improvement of recreational quality, meeting sport and cultural needs. On October 2012 in Sudeikiai was opened the football field with synthetic universal covering. It was the gift of Milda Petrauskienė, the Seimas Member for students and residents of Sudeikiai. Utena district municipality contributed to its installation giving almost 10 thousand Lt. She also thought about the sportsmen of other towns: Užpalių people got the same surface for football field 6 years before and the basketball team of town wining the laurels in various district competitions got the sport clothing. - The developed sports infrastructure in Utena district makes excellent facilities organise sports camps in various branches of sports, - said Nerijus Malinauskas. 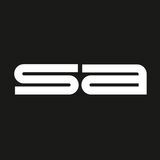 - We have the possibility to welcome athletes from neighbouring or foreign countries and offer them qualitatively rest and train. Moreover the Utena land has a natural, attractive nature, tempting tourists from many European countries. The economists have proven, that the communications infrastructure state is a reflection of a countries’ economy in general. The developed countries spend a significant part of their budget for maintenance and development of their communications infrastructure, because a properly developed and maintained connections infrastructure does not only guarantee safe, convenient and fast trips, but also, represents the country to the guests of the state. cially dependent on the upper constructional layer (pavement) material type and characteristics. Automotive roads’ and streets’ pavement is divided into three main groups, according to their type: • Non-rigid – one-layer or multilayer asphalt pavement, on top of banded or non-banded mineral base layer; • Semi-rigid –asphalt pavement on top of a rigid pavement (base) layer; • Rigid– concrete coating layer on top of non-rigid base layer. ment is non-rigid (asphalt). It is important to notice, that this pavement is planned for 15 to 20 years of use, but defects appear on the first year of usage and the damage is steadily increasing year after year. An average asphalt pavement needs repairs on the 8 to 10 year of operation: damage is repaired, the surface of the road receives treatment, the loose layer is replaced by the new one. It is also important to notice that the worn out layer is also being changed by a new one on the 15 to 17 year of the pavement’s operation. Depending on the operating conditions there is often a need to change the bottom and sometime even the base layer of such a road. In the case of properly prepared rigid (i.e. concrete) pavement, the road is to withstand 40 years of operation, and if it is properly maintained, it can be operated even longer. The typical repair works on the 20 to 25 year of a concrete pavement operation is just repairing the joints, the further maintenance works depend on the surface condition. Usual maintenance works include: joint repairs, inserts change, putting some additional concrete on the road, and other works that renew the operational characteristics of the road’s surface. The European concrete pavement association EUPAVE states, that the negative environmental impact of concrete pavement production, installation and maintenance is approximately 9,6 times smaller than in the case of asphalt pavement. Concrete pavement is light, thus it increases nighttime visibility – the amount of electricity needed to light the concrete paved road at night is up to 31% less, compared to asphalt. The light color of the road or the street heats less than the black asphalt, so concrete temperature is up to 12°C below its main competition. Concrete pavement rigidness does not change because of the effects of temperature or it changes very slightly, but the asphalt pavement rigidness decreases at high temperatures, resulting in plastic deformations. ported goods and great weights that destroy asphalt pavement faster than it would harm the concrete one. The constantly growing road maintenance expenses motivate to think about the way concrete pavement may be used in the Lithuanian automotive road and streets construction. However, the opinions on this issue are controversial. There is an opinion that the concrete pavement will fail because of the heavy load traffic being too small to compensate the high cost and complexity of operating a concrete paved road, the other states, that the concrete road is inconvenient and unsafe to drive. Are these doubts reasonable? Are todays concrete paving technologies do not guarantee good driving conditions? Is it true that concrete pavement isn’t cost-effective? Or maybe, concrete pavement is a modern product, promoting the use of local materials: sand, gravel, Portland cement? thousands kilometers of concrete paved roads and Germany with approximately 5,5 thousands of kilometers. Recently it is often used in road construction in Poland and the Czech Republic. Use in Lithuania There is only 72,5 kilometers of concrete paved roads in Lithuania and this accounts for less than 1% of the total road length in Lithuania. The highway A14 Vilnius – Utena concrete pavement road construction was started in 1975 and was open for operation in 1987, so we are looking at approximately 26 years of operation now. And although the road is not very comfortable to drive by, because of the increased size of deformational joints, there are no plastic deformations to be detected. In this case the concrete coating has not been justified because of the possibly improper installation and maintenance and so, it formed controversial opinions regarding concrete pavement. Concrete pavement is used not only in roads in Lithuania; some 30-40 years ago it was used to cover a part of the Vilnius airport runway and the whole of Siauliai military airport runway. Precast concrete panels were used to build the Kaunas airport runway and platform. We should also rejoice the fact, that during the year 2010, Lithuanian road construction companies used paver on the sliding formwork technology to successfully pave concrete coating on the Siauliai airport airplane docking places. Modern technology was used, as there were transverse and longitudal expansion joints installed in the pavement. density is being increased by deepened vibrating mechanisms, itâ&#x20AC;&#x2122;s texture is formed by a trowel at the end of the paver. The pavement should be protected from drying up too quickly and the effects caused by excessive moisture (rain). After the concrete starts hardening, but not later than two days since the layer was laid, the deformational/expansion joints should be cut out. When the concrete reaches itâ&#x20AC;&#x2122;s normative rigidness, the joints are being sealed away. repair costs of a concrete pavement stretch, during a 35 year long operational period are a whole 80 percent less than the repair costs of the asphalt pavement during the same period. The total cost to reconstruct a 100 meters long, 12 meters wide (3 lanes) pavement stretch with concrete pavement is 37 percent (479 745,26 Lt) smaller than the asphalt pavement cost (758 915,51 Lt). Taking the costs of operation in account, a properly installed and maintained concrete pavement can be economically very attractive. The rapid depletion of oil resources make oil prices rise, and a lot of the economists state, that it should grow even higher in the future. That is why it is very important to seek alternatives and ways to reduce road construction costs but still pave the road in an innovative, safe, sustainable and cost-effective way. Concrete pavement can be more effective than asphalt one in some cases and can be used to pave roads and streets. All the more, it would promote the use of our domestic resources. In summary, we can state, that model where concrete pavement is used in automotive roads and street construction in Lithuania, should be based on the experience of other countries, scientific research and experimental development principles. A history of bad experience It’s because of the above mentioned reasons, that we do not have any open concrete surfaces – concrete or reinforced concrete is usually hidden: covered with plaster, clinker tiles or covered with other finish. “The concrete was really horrible during the Soviet era and the people are still afraid of it – they say they don’t want that experience anymore. And it’s a pity, because we lose the ability to benefit from the positive traits of this material. “, - comments G. Natkevicius. “Although it’s true, that it’s hard to apply this material as finish and nobody wants to acquire better knowledge of the concrete casting technology, no one wants to develop their skills.” There aren’t a lot of these projects. Colleagues name architect Audrius Ambrasas as one of most successful in using this type of material. G. Natkevicius also notices, that one of the first, or at least one of the brighter post-soviet period objects, was the commercial building on the intersection of the Kestucio and D. Poskos streets, planned by theh Dalius Nainis and Jurate Raguckiene and built in 1999. Their work was evaluated by the “Architectural nail” prize of the architect’s union in 2002. For a large number of people the grey color of concrete is associated with the gray and slovenly Soviet era neighborhood reality. And architects Gintautas Natkevicius and Rolandas Palekas say that this is the main and understandable cause, why this material is often greeted with skepticism. The concrete was really horrible during the Soviet era and the people are still afraid of it – they say they don’t want that experience anymore. And it’s a pity, because we lose the ability to benefit from the positive traits of this material. an evidence of a human hand touch that provides warmth to the object. Clients sometimes lack trust G. Natkevicius notes that concrete needs tailored environment. It looks well when there is a good quality material nearby: wood, glass or carpets. The architect is happy with his idea to use triple layer concrete slabs while building the “Yvabalte” agricultural equipment trade and service center in the Kedainiai region. He used pre-fabricated concrete slabs, which were colored during their production. The Yellow center that was opened last year can be seen from afar. It’s a rare occasion for the construction workers to properly model the formwork and fulfill the technological part in an impeccable way. tambour in this project. The material showed its capriciousness this time too, but the small problems were taken care of with much more ease than during the 2005-2006 construction of the new “Litexpo” exposition center building, where the wall and the columns near the entrance were entirely made of concrete. At that point of time the clients insisted that all of the traces of the cement jelly on the surface should be removed. “I personally would have never done it, but in that case we have chosen the emulsion that changes the natural concrete sense the least, and used it to cover the wall to even out its color”,- the architect commented. The “Victoria” business center, that was built from 2004 to 2005 and was designed by the R. Palekas team, should also contain a tribute to concrete – it should have been used to finish the whole communication center: the staircases, the elevator sites, etc. “For certain reasons we could not leave the natural concrete without plaster finish, so we just made a joke and covered the walls with photography of the same concrete in that space”, - told us R. Palekas. The visitors see the concrete pores as moon landscapes. A couple of years earlier R. Palekas and his colleagues have designed a building completely made of concrete – it was a design of the culture center in Sigulda. “We had even designed the formwork, but the project is not implemented because of the economic crisis”, - lamented R. Palekas. “It would also be a very hard task. Sometimes it’s only after you make the final sketches is when you realize that the construction workers do not have the needed capabilities and just would not be able to construct it”. The long-term (2025) Lithuanian transport system development strategy, approved by the Government in 2005, focuses heavily on the modern public logistics centers (PLC), or the possibility to build freight villages. The “Lietuvos gelezinkeliai” (Lithuanian railways) company, which has become the founder of Vilnius, Kaunas and Klaipeda cities’ PLC, is absolutely ready to begin implementing the projects: the construction of the first two Vilnius and Kaunas PLC will begin in the near future. for it in Vilnius and Kaunas: possibility studies have been carried out, territory planning work is completed, special and detailed plans, technical projects, all have been already prepared. At this stage “Lietuvos gelezinkeliai” is already choosing contactors for this work. The Siaulial PLC is quite different from the rest, as it is being founded according to the municipality’s initiative. The “Lietuvos gelezinkeliai” has founded the State enterprise “Vilniaus logistics park” in 2011 to take proper care of the creation of the logistics park. This enterprise has been entrusted with the task to prepare land areas for the needs of potential investors – build warehouses and other logistics infrastructure and buildings. da are implemented in several stages, so the terms and financing is planned separately for each one of them, according to R. Sinkevicius. EU funds finances are planned to cover approximately 85 percent of the project’s cost, the other part of the costs will be covered by the founders of the PLC. The logistics centers along with the successfully developing railroad, automotive road, water and air transport interaction are planned to take a role in implementing the EU transport policy objectives – to transport 30 percent of all freight that should be transported for more than 300 km by railroads or water transport instead of roads. This figure should exceed 50 percent by the year 2050.
rounding neighborhoods, to the easily accessible PLC. There are plans to extend the bypass and connect it with the highway to Minsk. through the Klaipeda sea-port and near the I trans-European transport corridor, that connects the South of Europe with the Northern countries. Two intermodal trains are passing through the Vaidotai station, namely: “Vikingas” (the Viking) and the “Saule” (the Sun). A part of the southern Vilnius city bypass road is planned to go near the Vaidotai railway station. It is debated that in the end of the year 2014 there an intermodal terminal will be created with four load/unload railway tracks and a container storage area near the Vaidotai train station. The PLC and administrative customs building and a place to safe keep empty containers are also expected to be built by the year 2014. There are plans made for a modern automatic gate control system, so that the driver would not have to stop near the gate each time to show his documents. All of the needed engineering systems will also be connected to the intermodal terminal. The logistics park Vilnius PLC is founded together with the capital’s municipality. Thirty one hectare is already assigned to future investors. Companies that will choose to do their business in the PLC will have the possibility to build warehouses or other buildings that they need for transport vehicles, or any other activities directly or indirectly connected with logistics. It is planned that after some time a gas station will be built there, along with a truck wash, heavy vehicle technical service facilities, areas where people could rent a truck trailer, catering companies, banks, investment bureaus, small hotels and the likes of it. No competition between them Vilnius logistics center activities are primarily associated with services offered to the Vilnius region and the Belorussian market. Kaunas logistics center is associated with the continental flow of goods (instead of the transport sea corridor) most of which will come from Germany, Italy, France and travel to Latvia, Estonia, Finland, Russia and beyond. The terminal is planned to re-load the containers from one track to another, that’s why Kaunas sees the “Rail Baltica” project as important as the PLC one. Klaipeda’s logistics center project in the northern part of the “Draugyste” railroad station was the last to be launched. It is planned to finish its projects this year. Klaipeda logistics center is inseparable from the city’s sea-port. The intermodal terminal in the logistics center will be designed for both local and export markets. Money and time will be saved when an intermodal terminal, that could accept and unload a whole container train, will be built near the port. It would greatly benefit the city, because at this point of time it takes almost two days to take the container out of the sea-port. The public logistics centers that are currently founded will not compete with each other, each will have it’s own function and cargo flows, says the Head of the “Lietuvos gelezinkeliai” logistics projects department – Mindaugas Butnorius. Communications R. Sinkevicius is sure, that the State and private companies will really benefit from these works: they will improve the quality of transport services, will promote local transport services market development, will create a basis to develop all types of additional value services and secure the access of public transportation and logistics infrastructure for small businesses. It will also provide effective interaction between different types of transport and will take part in reducing of pollution and the amount of traffic incidents, will increase employment and create an attractive environment for foreign investment.